It’s easy to play the ‘What If’ game. Most people spend their entire lives playing this game. It’s pretty simple. You take your life and ask a “What if” type of question. What if that hadn’t happened? What if I met this person or that relationship worked out or I got the other job? The game is endless and so are the answers. But in truth if you’re asking “What if” that means it didn’t happen and your situation is still your situation. 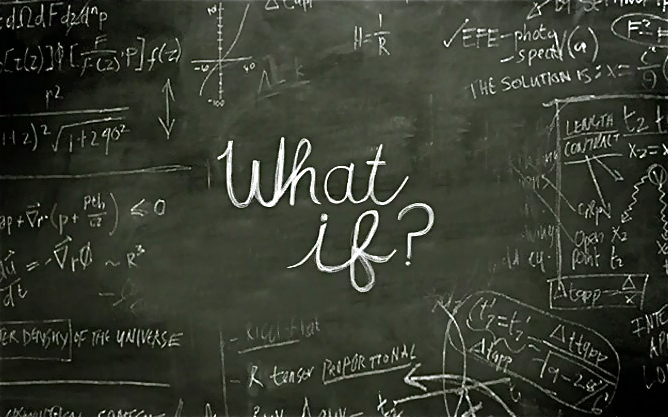 Spending hours of “What if” usually ends up being fruitless escapism. We rarely look at how at how much worse our life could have been with poorer decisions, unwise counsel, and a fistful of life. Instead we usually try to imagine how much better our life could have been in some way with a different set of variables. When taken to the extreme, if often leads to envy, self-pity, and depression. For the sake of this post, though, let’s play the game! I’ll ask the questions and you take a few minutes to give it some thought as to how your life would be different. What if you complained less and were more thankful? What if you took all the wasted time from your day and used it to study the bible or pray? What if you actually believed the bible for what it said? What if you not only believed what it said, but put faith to action? What if someone asked you the benefits of being a Christian? What if you took the chance and shared your faith with your neighbor? What if you actually counted all of your blessings? What if you really believed God had a purpose for your life? What if you chose to live a life completely sold out to Him and His plan for your life? What if you lost everything you have? Family, friends, finances, health, occupation, reputation? You see, here’s the rub: God does have a purpose for our lives and too often we spend our lives running from His purpose because we lack faith, knowledge of His word, a deepening relationship with Him, and we try to find pleasure in everything but Him. So what if we were to lose it all? What if, like Job, we lost our kids, our home, our riches, our health? I’ve said this before, but we’re so quick to criticize Job’s wife when she suggested he curse God and die. Ask any mother who has lost a child, let alone all ten of her children at one time, how much it hurts and you’ll notice the almost insurmountable pain in her eyes and words. With that in mind, her reaction to all the loss is much more understandable. But instead we stand in the doorway of our glass houses and throw rocks. Our response at even the smallest part of his losses would often cripple us spiritually. Paralysis with fear and doubt pervade our hearts and mind. Our friends, much like Job’s, would be questioning what secret sins we had that led to our calamity. Think about it. When you know of someone who loses a child or spouse you feel bad for him or her. Then they have a serious car wreck and jeopardizes their health you start wondering, “Why are all of these bad things happening to them.” Then they get laid off … all back-to-back-to-back and you start thinking, “Something’s seriously wrong in their life for everything to go this bad.” It’s so easy to judge from the outside. For Job, it wasn’t what he was doing wrong. He did nothing to bring on the destruction of his riches or the demise of his children. His fault, if you want to call it that, was being a man who was blameless and lived an upright life. He loved God and hated sin. Then the testing came. How do you respond when the testing comes to your life? Like Job? Like Job’s wife (who, incidentally lost everything, too)? Like Job’s friend’s. Job’s wife, in her soul crushing anguish suggested her husband curse God and die. Job’s friends peered down their spiritual noses and wondered what secret sin Job carried that God would punish him so severely. We may not always understand things that happen in our life. We may not know the reasons certain things occur to us. Our response and responsibility is to worship God for His mercy, love, and grace. We’re to respond, regardless of the obstacles we face, with a trust in His control of the situation. If we spend our time adoring and worshiping Him, we won’t have time to do what we normally do — worship ourselves and play silly ‘what if’ games. We must get past this mindset which is so deeply ingrained in us that we are the center of the universe. I want to respond to life’s challenges, hurts, and disappointments with the genuine, deep faith knowing this life is temporary and He is with me every step of the way. I know beyond a shadow of a doubt that He does have a purpose for my life and has called me to walk by faith even when I can’t see the way. I want to know Him more intimately with an ever-growing faith that He’ll never leave me or forsake me. With that heart I can find the joy and peace only He can bring regardless of what those around me may say.